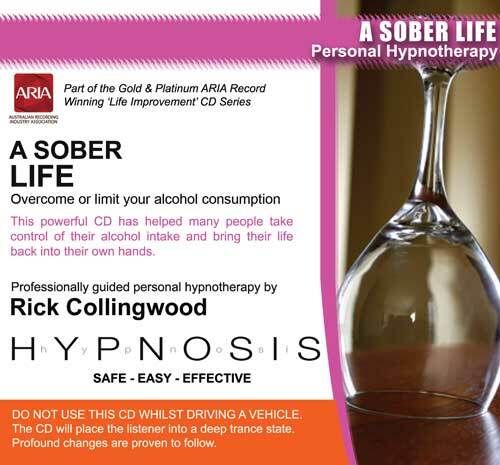 Achieve complete sobriety or simply lessen your level of alcohol intake with the powerful personal hypnotherapy CD/MP3 by Rick Collingwood. This session will support you emotionally to overcome alcohol addiction, keeping your mind at ease and focused throughout the whole journey. By using this program each night, you will be mentally reinforcing that you have the willpower, determination, and ability to stop drinking alcohol to your desired level. Through hypnosis, this is embedded into what is known as the subconscious mind, the same part of the mind responsible for so many of our decisions and actions at a deeper level that we don't often realise we are doing. Often it is past patterns and memories that cause alcohol addiction, and by using this session you will be able to put to rest your past and focus on maintaining a more sober future. Using this hypnosis session, over time your cravings for alcohol should become much lower, and by the end of the program, you may even wonder why you were a drinker in the first place. Also contained in this script is a visualisation process to imagine yourself at a social event, or somewhere that you used to always drink at, and you being there not drinking at all. This will help mentally prepare you for the inevitable situations in your journey to recovery where you may be tempted to return to old ways. By doing this you can quite literally play out the situation in your mind over and over to give you assurance you can maintain your goal of not drinking when the situation arises. Since I last contacted you I have lost 6 kilos!!! I also have been listening to Ricks sober c.d. every single day. I must admit I am finding it hard to kick the chardy habit but I have noticed I am thinking differently about what I am doing. I need you to know that since reading your book I have changed the way I think about things, I was in such a rut and after reading your book twice! I was given hope. I was in the zone of thinking I could never change but your book showed me that I can, and I have. I have joined a gym I'm doing fun outdoor exercises and meeting lots of nice people and feeling a lot better about myself. Once again Thank you and I hope that I can tell you soon that I have got to where I want to be!!! I have already noticed a difference in Kathryns attitude and actions this week, more focused, calmer, making plans for medical appts etc, talking to her sister and me about her past, anger and depression etc and how best to work on herself. Went out last night and only had a few drinks, she said she just did not feel like any more, which is terrific and I am sure a result of the cds.